This online auction features 2014 R 25 ft. Bennington Pontoon Boat with a Yamaha 60 HP motor. ART: Original Keirsteads paintings; 5 watercolours and more! JEWELRY: 14K and diamond ring, 2 14K amethyst rings, 14K ruby and diamond rings, 18K white gold ruby ring, mens 10K rings, freshwater pearl necklaces, 18K turtle pendant necklace and more! TOOLS: Delta belt sander, Skil drill press, Honda and Makita generators, Husky rolling two part tool chest, hand tools, wood tools and more! ELECTRONICS: Apple iMac computer; Sony Bravia 52" LCD TV and stereo with speakers; Bose Wave system; Remote contolled devices. STERLING SILVER: Vanity set; 20 pieces flatware. CRYSTAL: Decanters with stoppers from a shipwreck in Halifax; pinwheel, depression. FURNITURE: Danish side table; Deilcraft end tables and dresser; teak pieces. ANTIQUE: Metal bell signed Aneppomeni c 1888 and much more! 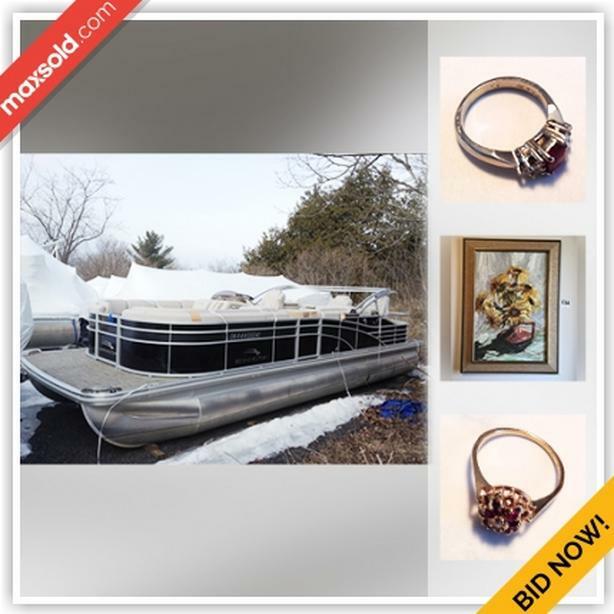 Please view catalog and pictures online at MaxSold https://maxsold.maxsold.com/auction/15553?utm_source=Used&utm_medium=post&utm_campaign=Verona-MapleDrive). Everything will SELL BY Monday April 22, 2019 8:00 PM regardless of price - everything starts at just $1. For more information, please visit our website.